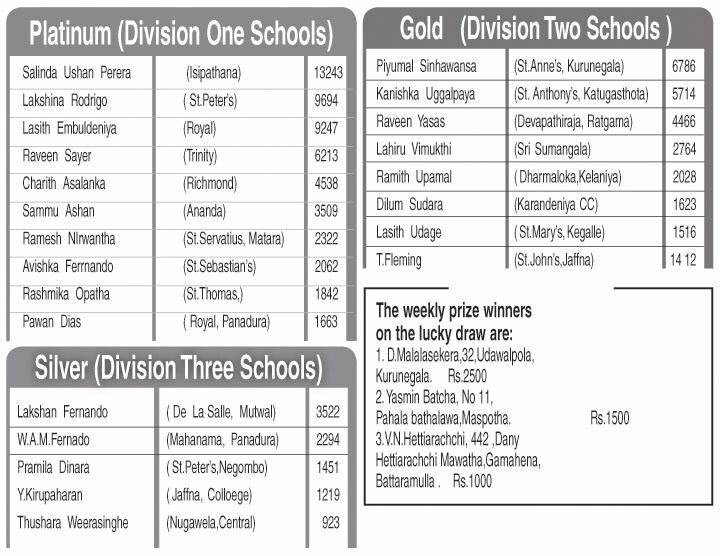 There were no changes at the top in all three segments with Salinda Ushan Perera of Isipathana ( platinum), Piyumal Sinhawansa (gold) St.Anne's Kurunegala and Lakshan Fernando (Silver) De La Salle , Mutwal at the top positions in the Sunday Observer/ Mobitel Most Popular Schoolboy Cricketer of the year contest 2016 at the end of the 11th week count. However, in the Gold segment for division two schools there is a stiff competition between Piyumal Sinhawansa and Kanishka Uggalpaya of St.Anthony's College, Katugasthota. with Sinhawansa leading by 1072 votes. In the platinum contest for division one schools there is a close tussle between Royalist Lasith Embuldeniya and Peterite Lakshina Rodrigo for the second place with Rodrigo in the second place with a majority of only 447 votes.